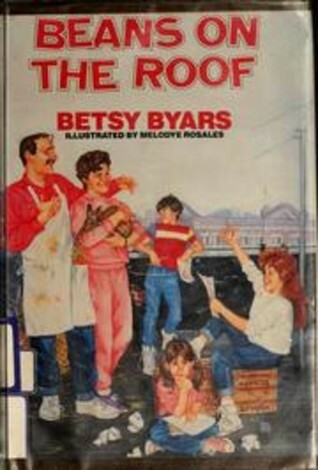 Most of the time, the Bean children - Anna, George ("String"), and Jenny ("Jelly") - are not allowed to go up on the roof. When Anna has to write a roof poem for a school assignment, however, Mama makes an exception for her, and soon the entire family is up there seeking poetic inspiration. This book is very spare and short compared to many others by Betsy Byars, and is clearly geared toward an early elementary audience. Even though the plot seems slight, however, Byars manages to pack a lot of subtle details into the dialogue and description. By virtue of the fact that George and Jenny have nicknames at school and Anna does not, the reader gains insight into each child's status among his or her peers and understands that Anna may be quieter and more serious than her siblings. The Bean parents' pride over Anna possibly having her poem selected for a book at school and their comments about not having finished school themselves and having grandparents who could not read at all tell a lot about their past and their future hopes for their children. Even the poems the family members write on the roof reveal something about each one's priorities and sense of humor. It never ceases to impress me how Byars can turn the simple day-to-day events of life into these heartwarming and meaningful stories. Beans on the Roof is a sweet book that could be used to introduce the concept of writing poetry to kids who are just beginning to compose their own works. It celebrates the warmth of friendship among siblings and the value of writing something you love even if it is not like anyone else's work, and even if it is not recognized by others in the way you hope. In some ways, it reminds me of some of Patricia MacLachlan's shorter, descriptive chapter books (White Fur Flying, The Truth of Me, Fly Away, etc. ), but with a lighter touch and a clear appeal to younger readers. I had never heard of this book before this reading, but even though it is not Byars's absolute best, it is still very satisfying and absolutely lives up to the quality of writing I have come to expect from her.